The distance from Ha Giang to Halong bay is about 400 km , it spends 8 hours getting there. 14.30: Our bus driver picks you up at the hotel in Ha Giang city. 15.00: Get on bus to Ha Long city. 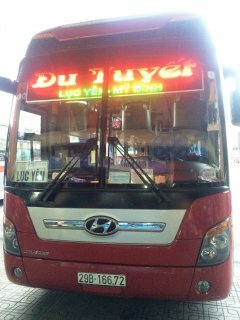 1.00 am: Arrive in Halong city in Bai Chay bus station (last stop). 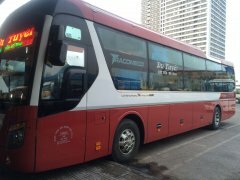 Included: Bus ticket to Halong city. 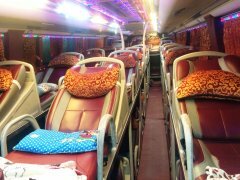 Hotel in Ha Giang city – Tuyên Quang – Thai Nguyen – Bac Giang – Bac Ninh – Hai Duong (shortbreak) – Halong city - Bai Chay bus station ( last stop). 20.00: Our guide and car pick you up at the hotel in Halong city to the bus station and get on bus to Babe lake. 6.00: Arrived Ha Giang city. Hotel in Halong city – Hai Duong – Bac Ninh – Thai Nguyen – Tuyen Quang – Ha Giang (last stop).